JUST like a thriller typically involving crime and mystery, the story of arrested Kidnap Kingpin, Chukwudumeje Onwuamadike, aka, Evans has remained captivating. Like a Hollywood movie with an exciting plot and phenomenal characters, the issue begets interesting and surprising angles each day. 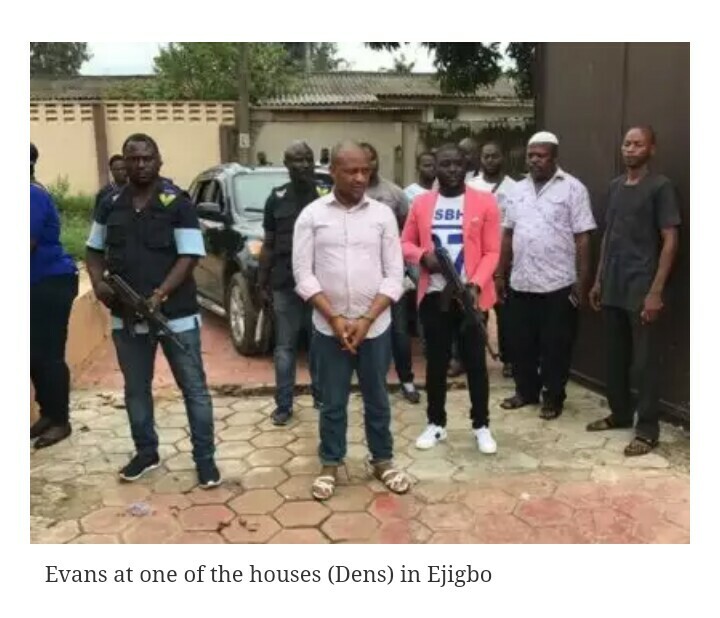 When you think Evans had narrated nearly all his escapades, more sensational and suspenseful narratives would emerge, producing new angles to the most intriguing criminal case in Nigeria’s recent history. Frankly, only the Lawrence Anini case of the 1980s could rival the Evans episode given that like the former, the latter was also the king of the underworld. Interestingly, the same kind of tragic flaw ended their respective episodes given that women were key to their downfall. At an exclusive encounter with SaturdayVanguard, during the week, Evans pondered on the events leading to his arrest and concluded that visiting his girlfriend, Amaka was the weakness that led to his fall. 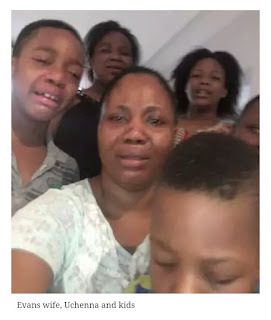 At the latest meeting with Evans at the Lagos State Police Command Headquarters, Ikeja, where he is being detained, the Nnewi-born kidnap kingpin made fresh revelations amid regrets about not leaving the country with his family. He told Saturday Vanguard that he knew the Police had identified the area he was living, a discovery he made on May 23, 2017, when the officer-incharge-of the IRT, Abba Kyari, visited Magodo Estate and held a meeting with the Divisional Police Officer and some residents of Magodo Estate. Evans revealed that one of the residents, who was part of that meeting alerted him to the Police presence in the area. The person, he said, informed him, who the Police were looking for and how they planned to carry out their operation. 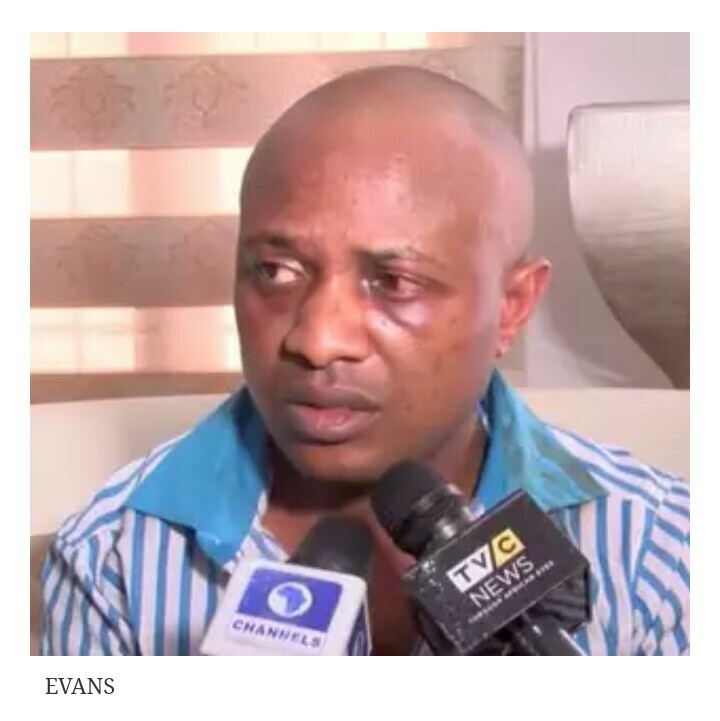 Evans said he quickly moved his family out of Magodo and relocated to a hotel in Ikeja. He said his failure to follow his instincts and leave the country immediately, having known that his girlfriends, sister and gang members had been arrested, gave him out. Narrating the new angles to his story, the Junior Secondary School dropout said: “My problem started on Friday, May 12, 2017, when one of my captives, Mr. Donatus Dunu, a Pharmacist, who I abducted at Ilupeju area of Lagos escaped. I got a call from one of my boys looking after my victims at my den at 6: am that Mr. Dunu escaped from that den at 4:30 am. They looked for him without success. At that time, I knew trouble had come. The next news I heard was that the Police had visited the place and my AK47 rifles, pistols and over 40 loaded magazines were recovered by the Police. ‘’ I was worried and I called my gang members wanting to know what actually transpired. They all blamed Uche, who was in charge of the den. I told them that I was going to deal with him. At that time, my mind started racing and I was trying to think of what to do because I knew that the Police would come after me with force. “ Five days later, I read a story in Vanguard Newspaper that the IGP had deployed, Abba Kyari and his men to Lagos State, to track my boys and 1 and they have also visited the den, where Mr. Dunu escaped from. That was about the same time they placed a bounty of N30million for information that could lead to my arrest. Some of my men, who got news started panicking, but I assured them that I was on top of the situation and that the police would not get me. My Second-in-Command, Felix called me and expressed fears, but I assured him that the Police can’t arrest me and I was also making preparations to kidnap one other person. “But in the afternoon of May 23, 2017, I got the shock of my life when a call from a man living in our estate informed me that Abba Kyari and his men, held a meeting with the estate security and the local police. He said they had information that the man kidnapping businessmen in Festac Town and Amuwo Odofin, receiving $1million as ransom from his victims was residing in Magodo Estate. The man also informed me that the estate and the Police have agreed to shut one of the gates leading into the estate to enable them to track me down through the vehicle I was using. He also told me that some of Abba Kyari’s men would disguise as LAWMA officials cleaning the streets and some of them would operate as PHCN staff to enable them to have access to people’s home within the state. The man, who gave me this information didn’t know that I was the one who the Police were looking for. I quickly moved my family out of the house and we relocated to a hotel in Agidingbi, Ikeja, where we started planning on how to relocate to Ghana. “While at the hotel, my mind wasn’t at rest, I didn’t know where the Police would be launching attacks from. I was on hyper-alert and I started thinking of how to make sure the Police didn’t get me. I quickly sold my Lexus SUVs because from the information I gathered from the man who called me, I learnt the Police were looking for a man, who drives a black and silver coloured Lexus SUVs. Then I got someone to move my mother out of Nnewi because I believed the Police may go after her and would want to use her to lure me. While I was making these plans, news came in that my Second-in-Command, Felix had been arrested by the Police. Someone from Berger Motors on Oshodi Apapa Expressway where we normally buy our vehicles called and informed me that the Police operatives picked him up at their park. I trusted Felix so much because he wouldn’t divulge any information about me to the Police. He had told me on countless occasions, that no matter the amount of torture he receives from the Police that he would not divulge any information about our activities. ‘’ While I was still contemplating on what to do next, I received another call from one of my girlfriends, Ijeoma, who I was so fond of. She said she wanted to see me. Immediately, I had this feeling that the Police had arrested her. I told her that she could not see me because I knew she was with the Police, then I dropped the call. I was very worried and needed to hasten our journey out of Nigeria. I planned to travel with my entire family to Canada but the Canadian Embassy refused to grant me a visa. So we decided to move to Ghana where I have three houses so we could apply for Canadian visa from Ghana. Two days later, Ijeoma’s twin sister who lives in the east called and informed me that her sister called from the Police station that she was arrested because of me and the Police wanted her to bring the sum of N200,000 as a bribe for her bail. I told her the Police were only deceiving her because the matter at hand was beyond N200,000 bribe. ‘’I asked her to look for a Senior Advocate of Nigeria, SAN, who could stand for her. I also told her to look for someone who knows the Inspector General of Police, so they can take her case to him. I told her that with such pressure the Police will release her because she didn’t commit any offence that would warrant her arrest. A few days after that, the Police swooped on my younger sister, Nzube and her husband and they took them to the Police station. I didn’t know how they did it, but I called their numbers for two days and they were switched off. It was then that I suspected that they have been arrested. Immediately I called my mother in Bayelsa State and told her that the people chasing me had apprehended my sister and her husband. Luckily my sister has never been to my house in Magodo Estate, it would be difficult for her to lead the Police to my place. I became confused. I didn’t know what to do. For me, I knew I was secured because I know how security agents track their targets but I was scared of my boys some of whom didn’t know how to secure themselves. I sent messages to some of my boys alerting them that security operatives were clamping down on us and they should all be careful. I asked them to stop sleeping in their houses and I also gave them tips on how to stay secured. ‘’One week before my arrest, one of my girlfriends, Amaka, who lives in Okota called me and demanded money. I asked her what she needed money for and she said there was no food in her house, adding that her children were hungry. I was surprised and suspected something must be wrong because I gave her N25, 000 for feeding two days before she made that call. I asked her about the money I gave her earlier, she said she had spent it. From that point, I suspected something was wrong. Then I switched off the phone she was calling me with. I had one special phone. Whenever the phone is switched off I will receive messages from her asking why my phone was switched off and she would be begging me to come and see her. At one point I called her mother and told her that I was suspecting that something was wrong with Amaka. I asked her to visit her house to confirm. Her mother sent someone there and after spending about two hours with her, I was informed that she was alright but she only needed money and they gave her N3000. That confirmed something was wrong. Amaka is the one that gives them money, not the other way round. They couldn’t be giving Amaka N3,000 because I know what I give to her. ‘’That singular action confirmed my suspicions that policemen were with her. I called her and told her that I had a feeling that there were policemen with her and they were trying to use her to arrest me but she denied. I asked her to give the phone to her children one after the other and asked them if there was any stranger in their house. They all said there was none. I wasn’t convinced because I knew how the Police do their job and how they think. I also knew that for a high-profile target like me, the Police will do everything possible to get at me. A few days later, my wife and children left for Ghana. Amaka was still calling and begging me to send money to her. The night before my arrest, I lodged in a hotel in Okota, close to her house and I could not sleep. I was busy drinking all night and I became very drunk. At 4:am I summoned the courage to see her. Her house is close to the road. When I got close to her gate, I stopped on the road and called her, when she picked I asked her not to drop her phone. I said she should stay on the call and meet me outside. She came bare-footed and was still on the call. I opened the door, she came in and I drove off with her. When we got far from the house, I took her phone and switched it off. I asked the identity of the people in her house but she said there was nobody in the house. I became angry, held her neck and I tried to kill her. She screamed and confessed that the policemen had been with her in the past one week and they were trying to use her to lure me. Instantly I pushed her out of my car and I zoomed off. ‘’While at Iyana-Ipaja, I saw some vehicles trailing me seriously and thought that they were policemen. At a point, I lost control of the vehicle and rammed it against a culvert on the expressway. I quickly abandoned the car and took a trycicle to where I could get a cab that could take me to my hotel. While in the hotel, I decided it was over and I needed to leave the country as soon as possible. At 7:am I checked out of the hotel and called someone to pick the car from where I left it. I took another taxi home. While in the house, I called an Uber taxi driver to come and pick me from the house. The driver was to take me from my house to Seme Border, where I would connect to Ghana, but while in the house and I was packing my things into the Uber taxi, the police showed up at my place and arrested me. I regretted going to see Amaka . When SaturdayVanguard inquired from Evans on how he was able to evade arrest during his reign, he said he knew the dangers associated with kidnapping. Evans revealed that he maintained multiple identities, adding that he ensured there were no pictures of him in circulation. He said: ‘’I beat security operatives over the years because my system is a sensor that detects problems. I don’t use charms of any kind but I developed the ability to detect danger since my early days as an armed robber. That was why I was able to know that the Police were close to me even when they haven’t informed me. I don’t snap pictures. In fact, I don’t have any picture. Nobody on earth had my picture before now. Even those who are very close to me don’t have my picture. ‘’My mother doesn’t have my pictures. My wife and siblings don’t have them as well. My pictures are not in my house and that made it difficult for security agents to apprehend me because they don’t know how I look like. Another issue you may have to take into consideration is the fact that I have numerous names for different people. My wife knows me as Somtochukwu, while all my girlfriends knew me as Mike. My neighbors at Gowon Estate knew me as George. ‘’I was also known as Sunny in Benin while in Portharcourt, I was known as Richard. These are the reasons it was difficult for policemen to track and arrest me. No one has my pictures and the names I bear in Lagos weren’t the names I had in other states. Ifeanyi (calling our reporter’s name), I would have been worse than this if I had proper education. With education, I could have done worse things and be elusive. But thank God it’s over and I have been stopped. Evans further disclosed that he treated his victims fairly, adding that the only wrong things he did were to chain, blindfold and detain his victim for months. He said he was doing these because he wanted his victims to meet his demand. He added that the only victim, who he treated wrongly was Mr. Cosmos Ojukwu, who he said he collected an extra sum of $200,000, from after receiving an initial payment of $1million. Evans said he threatened Ojukwu into paying the additional ransom of $200,000 because members of his family paid the $1million he demanded swiftly without wasting time. He said: “After he paid the $1million I demanded swiftly than I expected more. I informed him while he was being released that I would be collecting another ransom from him. I told him he would have to pay me an additional $200,000 because the $1 million he gave me earlier were in old currencies. I asked him to bring my balance.